Its name alone is intriguing and stirs interest. yet this tiny island in the Indian Ocean is a truly fascinating paradise, inviting you to uncover its remarkable surprises of nature in a one-of-a-kind environment. Venture to this awe-inspring island for an unforgettable getaway. Population: Christmas Island is home to a vibrant and warm community with a cultural mix that colours island life with many traditions, celebrations and festivals. The 1500 islanders making up the vibrant community include people of Chinese, Malay and European heritage and are proud of their home with a blend of Buddhist, Christian, Taoist and Muslim cultures celebrated openly. From it's early days of phosphate discovery in 1881, when settlers and workers arriving brought their cultural and religious traditions, the island community grew to become a fascinating melting pot of cultures. Today, visitors are welcomed and encouraged to join in, learn more and experience the thriving, contemporary Christmas Island "feel" in the many amazing foods, festivals and places. Islanders are proud of their home and its harmony, with a blend of Buddhist, Christian, Taoist and Muslim cultures that are celebrated openly. Places of worship are open to all. Currency: Christmas Island operates with Australian Dollars and is duty free. Credit cards are widely accepted, and most businesses have EFTPOS facilities. An ATM is available. Tourist information: Christmas Island lies in the tropical waters of the Indian Ocean, 2600 north-west of Perth in Western Australia, and 500kms south of Jakarta, Indonesia. It's warm year round with an average daily temperature of 27 degrees Celsius. Pack lightly, with a rain jacket for the wet season (December - April). Christmas Island is most famous for it's unique red crab migration, and is also one of the world's truly magnificent seabird breeding sites. 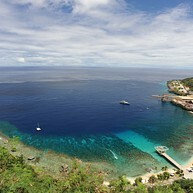 Two thirds of Christmas Island is National Park. Majestic rainforests, bountiful marine life and stunning land and seascapes make it a nature lover's dream. You'll find a range of inspirational nature based activities here from birdwatching, scuba diving, snorkelling and fishing to forest and coastal walks. Christmas Island’s narrow fringing reef supports bountiful marine life, including 88 coral species and more than 600 species of fish. 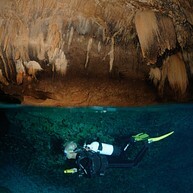 It’s an underwater wonderland for divers, with clear warm waters, coral reefs and spectacular wall dives. 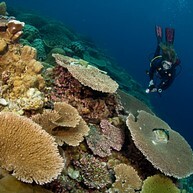 Soft corals, feather stars and gorgonian corals grow along vast walls which plunge into a seemingly bottomless abyss. 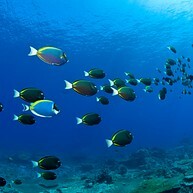 The fish community is distinctive because the island is a meeting place for Indian and Pacific Ocean fish species – it’s one of the few locations in the world where you’ll see Indian and Pacific Ocean fish swimming side by side. Some of these species interbreed to produce hybrids. Christmas Island has more hybrid fish than anywhere else in the world, making it a marine hybridisation zone of international significance. In addition to the hundreds of species of tropical fish, dolphins inhabit the island’s waters and whale sharks regularly visit during the wet season. Whale sharks generally first appear when the red crabs are spawning at the start of the wet season — they converge to supplement their plankton diet with crab larvae. Locations such as Flying Fish Cove, Ethel Beach, Dolly Beach, West White Beach, and Winifred Beach offer scuba divers and snorkellers a rewarding marine experience. At Flying Fish Cove and Ethel Beach shore diving is possible depending on the time of the year. There is excellent fishing, with sailfish, tuna and wahoo among some of the fish to be caught. You’ll find boat ramps at Flying Fish Cove and Ethel Beach.